Later that night, she awakens to find herself surrounded by the Alligator King and his swarm of nutria. But the Nutcracker and toy soldiers come to Merrae’s rescue. The Nutcracker then turns into a prince and sails off into the swamp with Merrae in a pirogue. When they arrive in New Orleans, they meet the Sugar Cane Fairy and such dancing delicacies as crawfish, cayenne peppers, beignets, king cake, and a flaming bananas foster. 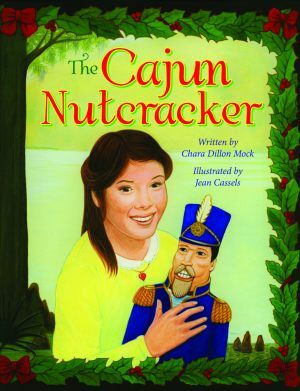 During the adventure, readers will learn about Louisiana culture, along with a few Cajun words and French phrases. With vibrant illustrations of a fantastical ballet, this book is perfect for aspiring ballerinas. Native New Orleanian Chara Dillon Mock is an education coordinator and ballet teaching artist at the New Orleans Ballet Association. In addition to dancing her first production of The Nutcracker with the New Orleans City Ballet, she performed works with the Jefferson Performing Arts Society, Ballet Hysell, and the University of Kansas Dance Company at the University of Kansas, where she received her BA in dance. Mock has been studying dance for more than three decades. She lives in New Orleans, Louisiana. Jean Cassels is a teacher at the New Orleans Academy of Fine Arts. She attended the Art Institute of Chicago and the University of Illinois School of Art & Design, where she received a BA in studio arts. Cassels has received such honors as the Golden Kite Award for Best Illustrated Children’s Book and the LSU Giverny Award, among others. She lives in New Orleans, Louisiana. A dancer-turned-author teams with one of the area's most experienced illustrators to give the beloved ballet story a Louisiana twist.